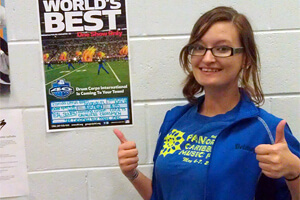 a poster promoting the DCI Orlando event in her band room. Drum Corps International is currently seeking current corps members, and high school and college students in cities across the United States to join its dedicated team of DCI Ambassadors. The Ambassador program is a new initiative launched by DCI this winter to help promote its summer series of competitive events and build excitement in local communities about the upcoming 2012 DCI Summer Tour. "Some of DCI's most enthusiastic fans across the country are the high school and college performing arts students out there who are so eager to share their passion for the drum corps activity," said John DeNovi, DCI Director of Sales and Business Development. "We wanted to tap into their incredible energy and give these super fans the tools to help us fill the stands at stadiums across the U.S. this summer in support all of DCI's performing corps." After registering, Ambassadors are mailed a packet of information and other promotional materials from DCI's headquarters in Indianapolis with all of the tools needed to help promote DCI Tour events in their schools and communities. Ambassadors are encouraged to distribute the included promotional posters and flyers, communicate with fellow friends and band members about how to purchase tickets to DCI events, and spread the word about drum corps online through social media and other websites. In just a few months since the launch, DeNovi says that almost 2,000 individuals from nearly all 50 states have registered to be DCI Ambassadors. "The Ambassador program is totally free to join and to be a part of," DeNovi said. "Though we're only a couple months away from the summer season, we're still looking for as many people as possible to help spread the word about this summer's schedule of DCI Tour events and to grow the drum corps activity." 3. Help spread the word! Ambassadors are asked to represent Drum Corps International with their friends at school, tell them how they can get tickets to a show, and to grow drum corps in their areas by hanging posters, distributing flyers, and spreading the word about the 2012 DCI Tour schedule. Register to become a DCI Ambassador today. View the complete 2012 Drum Corps International Tour Schedule.